In 1990, a year after Erspamer’s letter reached me, I travelled back to the Gálvez with Moises and my friend Larry LaValle—who had been with Chuck Dudell and I on my first trip to the Amazon in 1984. We hiked across the jungle to Pablo’s, discovered his camp burned, and moved down the river, where we happily found him at San Juan. “Malos casadores,” Moises snarled, after we’d been watching the men of San Juan trying to find a dow-kiét for nearly an hour. He was still grumbling about the state of the Matsés when I heard Pablo calling me. He was standing on a hill at the back of the pueblo with Pa Mi Shua and two of his children. Yes, I would like a dow-kiét. Pablo laughed and began to bark out the frog’s mating call. The other men in the camp stopped their hunting and watched him. Between the guttural barking noises he was making, we could hear him berating the frogs for making the hunt so difficult. Pa Mi Shua and his children, walking alongside him on the path toward the center of camp, roared at his antics. Suddenly Pablo stood and stiffened. From the grasses on the side of the path came the same sound Pablo was making. He barked again, and again his call was returned. Then a second frog joined the first, and a third, and suddenly the whole camp seemed to resound with the barking of dow-kiéts. Pablo bent down and picked one up by putting a branch on the ground and letting the frog climb onto that. “¿Mas dow-kiét, Petro?” More, Peter? I laughed and said yes. He put the branch back on the ground, called again, and in a few minutes a second frog climbed onto it. More? Did I want a lot of sapo? I told him two were enough. He collected a third anyway, then came into the center of the camp, holding the branch in front of him. I studied them: They were beautiful. A little smaller than my palm, they each had an extraordinary, electric-green back, a lightly spotted white underside and deep black eyes. 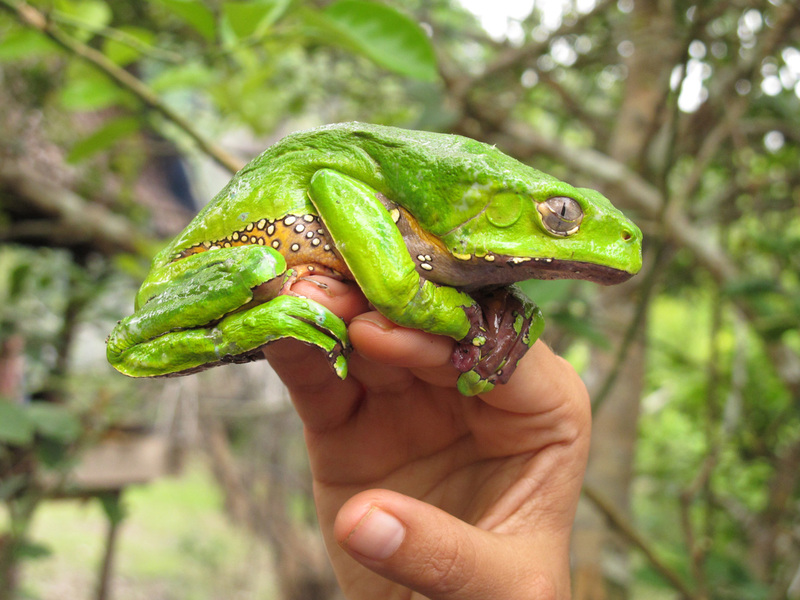 One of them climbed onto my hand and grasped my fingers tightly, and in seconds I could feel my blood begin to heat up as the sapo it was secreting began to seep into the insect bites and small cuts that covered my hands. I quickly put it down. Pablo giggled with delight and put the dow-kiét back on the branch, hilariously imitating my reaction. 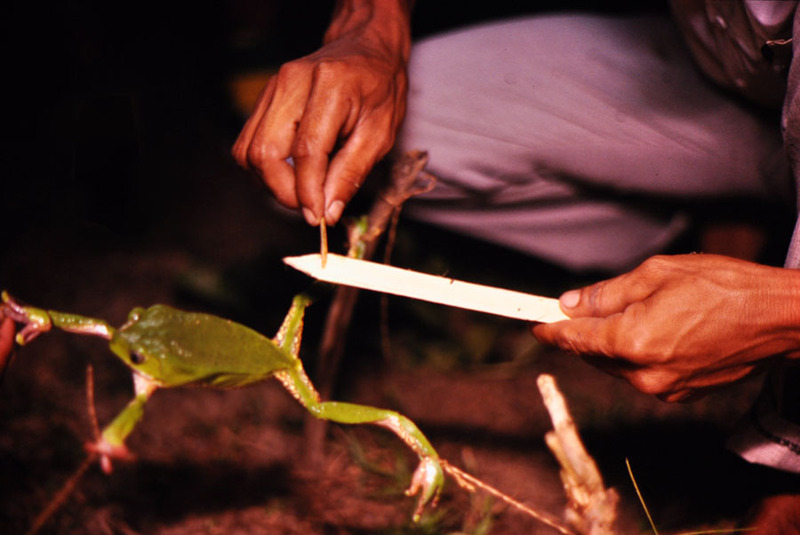 One of the Matsés men collected four sticks and stood them in the ground, making a small square. Another pulled apart some palm leaves, stripped out the fibers, and rolled them into strings against his leg. He handed four of them to Pablo, who tied one end of each to the four sticks, then tied the other ends to the frog’s legs, suspending the animal like some strange green trampoline. 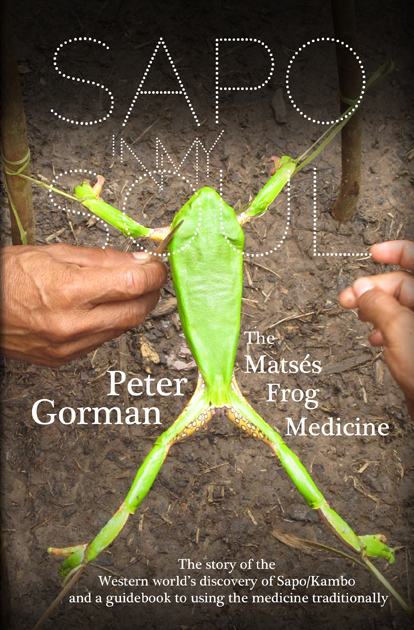 Once the frog was secure, Pa Mi Shua knelt and gently began to manipulate the frog’s elongated center toe between her fingers, stimulating it to secrete sapo. It was an unexpectedly sexual image, and the men joked about it. Pa Mi Shua grinned and told them to be quiet. The man who had placed the sticks in the ground disappeared into his hut for a moment, then returned with a piece of split bamboo. He began to scrape the suspended frog’s sides and legs, collecting sapo. We didn’t know it at the time, but Moises and Larry and I were the first known outsiders to watch and photograph the beautiful little green frog get strung up and “milked.” After the milking was done, the frog was set free, and the whole village laughed and cheered as it made its way to the edge of camp and disappeared. The man who had done the scraping dried the secretions out over our tiny kerosene lamp then gave the stick to Pablo, who wrapped it in a leaf and gave it to me. That night the remaining two frogs were tied by one leg to a low tree branch to keep them from escaping, and in the morning the sapo from one of them was collected. Neither was hurt by the process, and, if I hadn’t been taking the two specimens back to the U.S., they would have been set free. One of the frogs died shortly after I returned home, and I gave its body, which had not yet begun to decompose, along with part of the sample and some photographs, to the Museum of Natural History. The healthy dow-kiét, along with a second sapo sample and similar photos, was sent to Erspamer in Rome in a small box that Larry stuffed with leaves from the branch the frogs had been collected on, along with a moist sponge to make sure it had sufficient water. Larry punctured air holes in the box and we sent it by the fastest service we could find and prayed it got there OK. It did. He explained that among the several dozen peptides found in sapo, seven were bioactive—meaning that each has an affinity and selectivity for binding with receptor sites in humans. (A receptor is like a lock that, when opened with the right key—the bioactive peptides—triggers specific chemical reactions in the body.) The peptide families represented in the dow-kiét included bradykinins, tachykinins, caerulein, sauvagine, tryptophyllins, dermorphins, and bombesins. Phyllomedusin—a new peptide of the tachykinin family—strongly affects the salivary glands, tear ducts, intestines, and bowels and contributed to the violent purging I’d experienced. Sauvagine causes a long-lasting fall in blood pressure, accompanied by intense tachycardia—heart palpitations—and stimulation of the adrenal cortex, which contributed to the satiety, heightened sensory perception, and increased stamina I’d described. Phyllokinin, a new peptide of the bradykinin family, is a potent blood-vessel dilator and accounted for the rushing in my blood during the initial phase of sapo intoxication. The sauvagine extracted from sapo was given subcutaneously to rats and caused “release of corticotropin (a hormone that triggers the release of substances from the adrenal gland) from the pituitary, with consequent activation of the pituitary-adrenal axis. This axis is the chemical communication link between the pituitary and the adrenal glands, which controls our flight-or-fight mechanism.” The effects on the pituitary-adrenal axis caused by the minimal doses given the laboratory rodents lasted several hours. Erspamer noted that the volume of sauvagine found in the large quantities of sapo I’d described the Matsés using would potentially have a much longer-lasting effect on humans, and would explain why my feelings of strength and heightened sensory perception after sapo use lasted for several days.